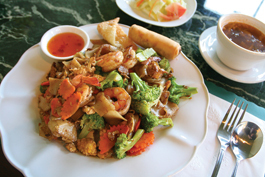 BRIGHT FLAVORS: Siam's 'see ew' dish features a blend of prawns, carrots and broccoli. IT'S NOT New Year's Day yet, but I'm going to make an early resolution. I'm going to eat at more Thai restaurants. In my more than four years as Metro's restaurant critic, I've reviewed a total of one Thai restaurant. What's that you say? Silicon Valley is full of Thai restaurants? I know that. But over the years I've tried in vain to find one that goes beyond the same old pad thai, tom yum soup and pad prik king, one that offers something distinctive to set it apart from the multitudes. I'm still looking. However, I've come to realize my Thai restaurant boycott is shutting me off from a lot of good food. I may not have found a Thai restaurant that offers an array of regional specialties, but there are more than a few restaurants that merit some attention, places like newcomer Siam. Six-week-old Siam restaurant occupies a space in a newish-looking minimall off Stevens Creek Boulevard in San Jose. It's an island of calm between Valley Fair and Santana Row. The restaurant is a rather impersonal-looking space on the outside, but inside the owners have done a good job of making the small dining with its dozen tables feel friendly and welcoming. There are fresh orchids on some tables and a fresh fruit display behind the cash register. The small kitchen is located behind a thin partition so you can hear the clang and sizzle of food being made. The menu offers a lineup of Thai standards and crowd-pleasing combinations with Americanized names like "cashew lover," "Thai angry" and "pleasing garlic." There's plenty to recommend. One of my favorites is the spicy crispy catfish ($12.95), boneless chunks of catfish lightly fried and tossed with Japanese eggplant and bell peppers in a lively, chile-based sauce that's at once spicy, sweet and tangy. Fresh, young green peppercorns still clinging to the vine add a bright, peppery note. Chicken satay ($7.95) is a common dish, but it's done well here. Juicy pieces of chicken breast are marinated with coconut milk and various spices for a simple but delicious starter that's great with the accompanying peanut sauce. Tod mun ($7.95) is another standard appetizer but the kaffir lime leaf–enlivened fish cakes are as good as any I've had and even better with the cucumber-peanut sauce served with them. Less good are the thick and heavily wrapped fried Thai spring rolls ($6.95) and prawn rolls ($7.95). The restaurant's $7.95 and $8.95 lunch specials are good bargains even if the salad that comes with the meals is pretty weak. It's nothing but a few leaves of iceberg lettuce dribbled with a forgettable thousand island dressing. The soup on my lunch visit was pretty boring, too: vegetable broth, vegetable and tofu. It tasted like chicken soup more than anything else. A far better soup is the gang jued ($7.95 small, $9.95 large), a refreshing and fresh tasting soup of marinated and ground chicken, clear rice noodles, tofu and Chinese green in clear broth. Siam has the regular lineup of red, yellow and green curries but also a few less common ones such as the southern-style jungle curry, a red, kaffir lime and galangal root–spiked sauce made without coconut milk and loaded with various vegetables and the meat of your choice. Also good is the Siam barbecue chicken ($9.95), tender pieces of grilled chicken marinated in coconut milk, chiles and a currylike paste. The tangy, aromatic and sweet flavors match well with the grilled, smoky chicken. Siam's pad thai ($8.95–$13.95, depending on choice of meat or tofu) is decent, but not particularly noteworthy. See ew noodles ($8.95–$13.95) is a simple but satisfying pan-fried dish with wide noodles, wok scrambled eggs, broccoli and carrots with a light soy sauce glaze. Desserts are typical Thai fare, fried bananas with ice cream ($5.95); sweet sticky rice with mangos or coconut ice cream ($5.95). For something a little different, go for the Thai roti ($5.95), light fried bread served with nondairy, coconut milk–based ice cream imported from Thailand. In addition to the fresh, well-prepared food, part of Siam's appeal is its friendly, attentive owners who come from Phuket, the popular vacation destination in southern Thailand. Heidi Thanasawasdi runs the restaurant along with her mom, Sirilak Thanasawasdi, and dad, Nai Siripakdi, with the help of Psai Tsoon, a chef from central Thailand. Because of the restaurant's small space, the owners shop for produce daily at local farmers markets and try to buy only organically grown fruit and vegetables. As pleasant as Siam is, I'd like to see the menu go a little deeper. Heidi Thanasawasdi told me sometimes they offer a fiery, off-the-menu dish from southern Thailand for their Thai customers. What about the rest of us? How about a special menu that features lesser known, regional dishes from Phuket or the chef's home in central Thailand? Silicon Valley diners are a diverse and adventurous lot and I bet there would be plenty of diners who would jump at the chance to try something new and expand their knowledge of Thai food. But in the meantime, Siam's familiar menu satisfies quite nicely. Address: 2910 Stevens Creek Blvd., San Jose. Hours: 11am–3 and 5pm-10pm Mon–Fri, 11am–10pm Sat–Sun.